This page shows how to setup a scene (almost) from scratch with Vision, Avoidance and Locomotion animation using mostly Channel Operators. 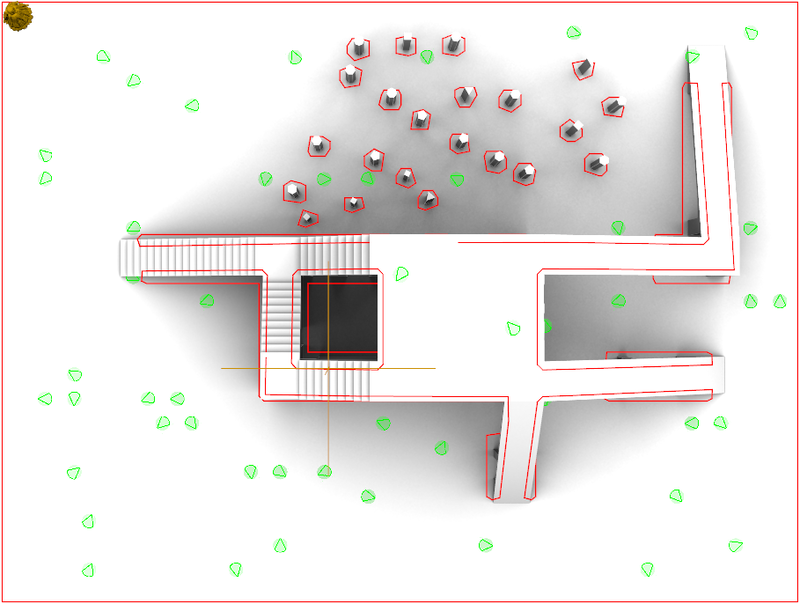 The first step in this tutorial is to add some Channel Operator to move our entities in the environment. That's obviously not the point of this tutorial, but this demonstrates how Channel Operators do work. Now that we know how to teleport entities, let's try to make them move in a smooth way instead of teleporting them all at the same place. 6. First, delete the ChOpInput created in step 5, rename the ChOpOutput node into "outputPosition", and open the Node Editor showing inputs/outputs of the outputPosition node to see the graph of channel operators. output it to the entity position. This stage will add the entity position with the delta position to give the final entity position, rename it into "finalEntityPosition"
This stage will input the current entity position into the graph, rename it into "inputEntityPosition"
Configure the Expression to use the Channel "this.position"
This stage will compute the delta position to add, rename it into "deltaPosition"
This stage will convert the current entity orientation (angle in °) into a world direction (vector3), rename it into "moveOriToWorldDir"
This stage will input the local delta orientation in which moving the entity, rename it into "relativeMoveOri"
This stage will set the speed at which moving the entity, rename it into "moveSpeedMultiplier"
Entities are moving fine, but they don't take the environment into account. Let's add some sensors to them. 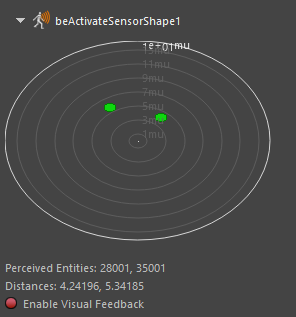 This creates a Sensor Locator that allows entities to perceive the obstacles in the simulation. 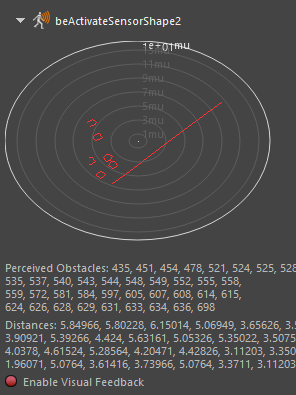 Obstacles can be either entities, or navigation obstacles (NavMesh file loaded in the Terrain locator). 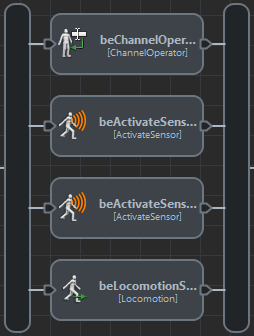 Configure one of the Activate Sensor behaviors to activate the first sensor, and the other to activate the second sensor. The first part of the tutorial detailed how to create and connect new Channel Operators. This part will focus on the graph itself and the configuration of each channel operator. To allow the entities to slow down, the moveSpeedMultiplier node will be removed and replaced by a subgraph of nodes that will compute the desired speed for the entity. New Channel Operator nodes are highlighted in green. 1. In the above graph, the fullSpeed (the expression is configured to 5) and zeroSpeed (expression configured to 0) are interpolated using a Multiplexer Channel Operator to obtain the desiredSpeed (configured as interpolator default, be careful of the indices of the previous channel operators plugs, as each input has a different meaning). 2. The weight that interpolate between the full speed and 0 comes from a Sensor Input Channel Operator . The Sensor Input Channel Operator is a specific Channel Operator node that allows to input values from the Sensors into the graph of channel operator. 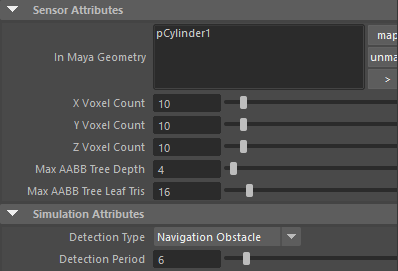 In this case, we need the Sensor Input node to input a value that varies from 0 to 1 depending on the distance of perceived obstacles in front of the entity. 3. Finally, the desired speed is multiplied by the simulation dt (simulationDt, with an Expression set to 0.04, which is approximately the duration of one frame à 24fps) to obtain the distance to move in a single frame (moveDistancePerFrame , configured with the multiply operator). Stopping in front of obstacles is fine, but wouldn't it be better to avoid them instead ? Here is the graph of channel operators that allows that. 2. 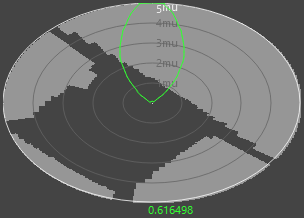 To avoid fast turning rates, the sensor input is used trough a clamp operation ("desiredDeltaOrientationShape" configured with a clamp operator) that limit the delta orientation per frame to something reasonable. The "maxNegativeAngularChangePerFrame" is configured to -5, and the "maxPositiveAngularChangePerFrame" is configured to 5. The filtered output is then connected to the existing moveOriToWorldDir instead of the relativeMoveOri that was just deleted. 3. The body orientation of the entity should also be modified to reflect the entity movement direction. 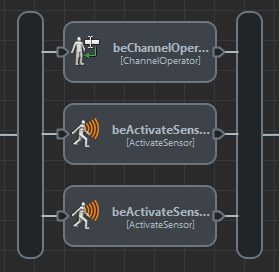 Select the Channel Operator behavior again and add a new output . 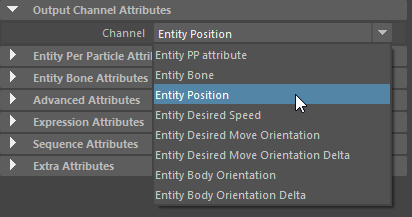 Configure it to Entity Body Orientation Delta, and rename it "outputBodyDeltaOri"
Ok, the navigation is working, but what about an animation on top o fit ? The best way to do it is trough a Locomotion Behavior, but as the Locomotion Behavior will handle the entity's position and orientation, part of the channel operators in the graph become useless. 2. Now select the "outputBodyDeltaOri" and change its configuration to Entity Desired Move Orientation Delta. The Locomotion Behavior will read this attribute, and compute the blend of motions that should reach the desired move orientation. Rename the node into "outputDesiredMoveDeltaOri"
3. Now select the Channel Operator behavior again and add a new output . Configure it to Entity Desired Speed, and rename it "outputDesiredSpeed"
4. The desired speed is already computed thanks to channel operators previously made, so there is nothing else to do than connecting it. 5. The next thing to handle is the Locomotion Behavior.